This is spiced rice with vegetables from Tarla Dalals Stir fry cook book and its so quick to make and way too colorful!! Heat the oil in a pan add the onions and stir-fry until brown in colour and keep aside. In the same oil add the garlic and capsicum and stir-fry for a minute. Add the tomatoes, boiled vegetables, turmeric powder, chilli powder and salt and stir-fry for a couple of minutes. Add the rice and fried onions and mix well. Serve immediately. Very colorful, you have done it so perfectly, I don't see even one grain of rice broken..
Super flavourful,colourful and inviting one pot meal..
Looks great. And can be made so quickly. perfectly done...rice looks so inviting n colorful! loved the way u cut the veggies n rice cooked...very nice! 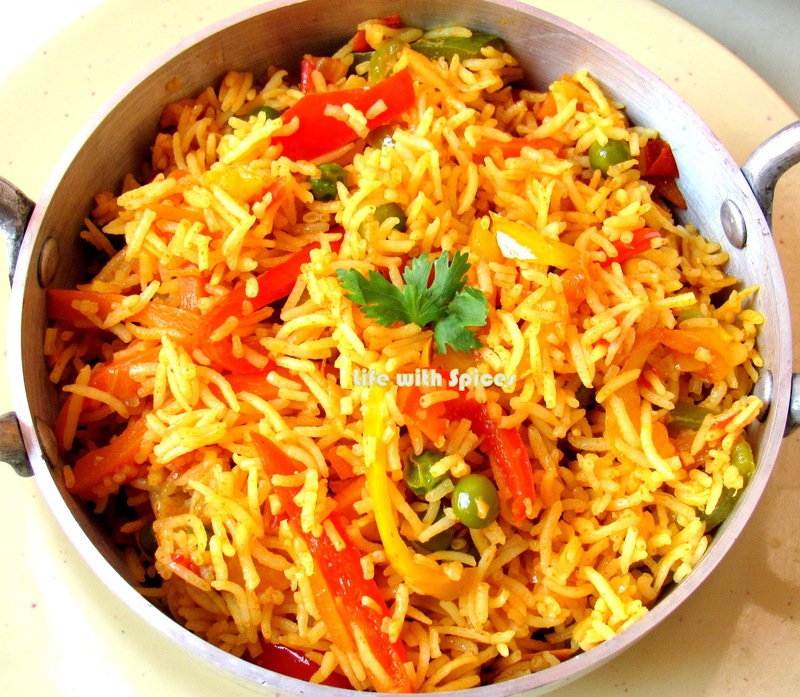 simple n colourful rice looks inviting!! Sounds so delicious and looks tasty. Delicious n colorful dish, sounds so yummy n healthy.